I recorded a talk for Radio 4 a few weeks ago. It's being broadcast tonight at 8.45 if you fancy a listen, in a series called Four Thought. The brief was 'unscripted talk' so the first thing I did was write a script. Obviously. I'm not stupid enough to improvise straight into a microphone. But then I sent that script to Matt and Alex for thoughts and they both very gently and helpfully pointed out what was wrong with it. Matt was so convinced of its wrongness that it provoked this blog post. Alex, more subtlty, just damned me with some faint praise. Thinking about their feedback, they were both right. I also tried reading the thing out to Anne and Arthur, and the looks on their faces told me that I must never, ever read anything out in public. I just don't have the actorly chops to make a script sound unscripted. And it was way too long. 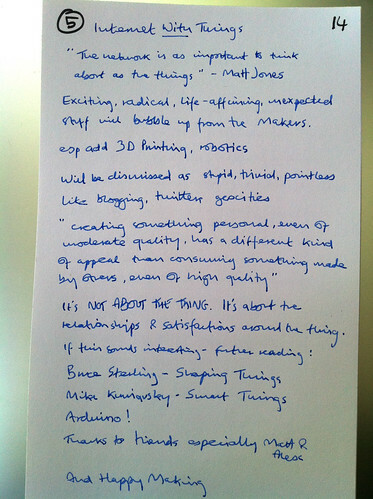 So, I threw everything away, including most of the ideas, wrote myself some quick notes (see below) and turned up at the RSA to do the talk. I do not recommend this approach, but at least it succeeds in being unscripted. I've no idea what it'll sound like. I can't really remember what I said, it was just a blur of nerves. They were very nice though. If you get asked to do it, you should, it's chastening for the soul to be that exposed. And Giles Edwards, who produced it was hugely helpful and sympathetic. The only thing I definitely remember is that I described Andy and Alex as both designers and my friends and I only described Matt as 'a designer'. I regret this omission. I like to think Matt is also my friend, he may disagree. One thing to bear in mind too. It's intended for a general audience - people who've never heard of The Internet Of Things and don't remember GeoCities. You lot might find it a bit simplistic. I think of blogging as networking for shy people. I am very shy. I hate meeting new people. I'm very bad at small talk. I assumed, going into my thirties, that my small circle of friends would gradually decline until I died. 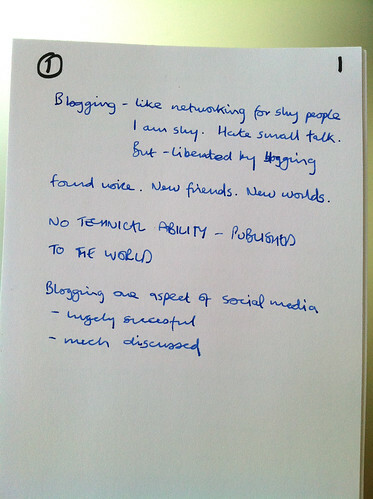 But blogging, for me, was genuinely liberating. I found a voice, I found new friends, I connected with people without the need for small talk and chit chat. I discovered I could publish to the world without having to know anything technical or learning to code. That was different and special. And, now we've learned that blogging was just an early manifestation of 'social media'. A hugely succesful and much discussed phenomenon that's changed all sorts of businesses and practises and lives. One of the not-very-much-discussed pioneers of social media was a site called GeoCities which lived on the web from 1994 until 2009. 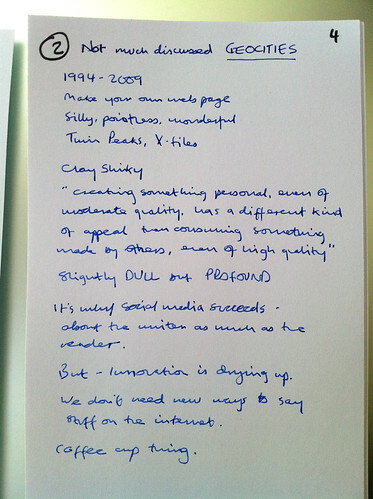 It was many people's first site, their first home on the web, their first opportunity to create their own page online. It was silly, pointless and wonderful. It was the single greatest repository in the world of opinions on Twin Peaks and the X-Files. "creating something personal, even of moderate quality, has a different kind of appeal than consuming something made by others, even of high quality"
This is deeply profound and true, though slightly dull when read out. It's the single best explanation for the triumph of all sorts of social media things from MySpace to Twitter. It's why social media works. It's about the writer and the act of writing, as much as it is about the reader. But, social media feels done. Baked. It feels like we don't need a bunch of new social media tools or publishing technologies. It's pretty easy for anyone who wants to put something on the web to do so. It reminds me of a thing I saw in a coffee shop a while ago. A little plastic thing, a bit like an ice-cream spoon. I couldn't work out what it might be for. And then I realised that it's to go into the hole in the coffee cup lids to stop the coffee spilling out. That feels a bit like the technological moment we're in with the social web. Were fiddling around at the edges of mostly solved problems. So I've been wondering what else might be going on. What might be next for technology and people? If you listen to big business and big technology then the next big thing will be the Internet Of Things. What's that? The clue's in the name. It's about connecting objects to, and via, the internet. One of these big businesses say there'll be 50 billion objects online by 2020, though they've also said there'll be a trillion, and of course they have a vested interest in connecting them. But whatever the numbers a lot of objects are going to get connected. It's a world of surprisingly well-funded EU research and long reports from consultants. It's a world of Smart Cities, Smart Grids and Smart Everything. It's full of jargon and acronyms like RFID, NFC and QR codes. It's a world of sensors embedded in bridges so they can report when they need maintaining. A world of sensors in roads so they can report on the weather or accidents. A world of sensors in the collars of cows so they can report on their sickness or pregnancy. The problem, though, with the Internet Of Things is that it falls apart when it starts to think about people. When big company Internet Of Things thinkers get involved they tend to spawn creepy videos about sleek people in sleek homes living optimised lives full of smart objects. These videos seem to radiate the belief that the purpose of a well-lived life is efficiency. There's no magic or joy or silliness in it. Just an optimised, efficient existance. Perhaps that's why the industry persists in inventing the Internet Fridge. It's top-down design, not based on what people might fancy, but on what technologies companies are already selling. Fortunately, though, there's another group of people thinking about the Internet of Things - enthusiasts and inventors who are building their own internet connected things, adding connectivity and intelligence to the world in their own ways. 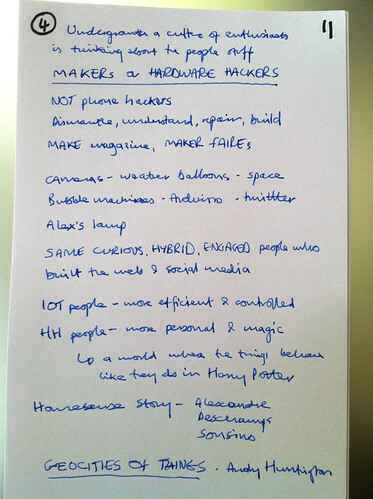 They're sometimes called Makers or Hardware Hackers. They're not the kind of Hackers who break into people's phones. They're the kind of Hackers that like taking things apart so they can understand them, repair them, improve them. All sorts of things, not just computers, anything technological. It's not a new phenomenon, of course, but it's found some new energy and coherence recently due to things like Make magazine and events like the Maker Faires. And because of the invention of a little device called the Arduino. The Arduino is a little, cheapish device that allows you to easily connect some electronic thing you've made to your computer and to the internet. And it brings all sorts of madcap invention to the Internet Of Things. It does for making connected hardware what blogging did for publishing. Makes it easy and liberates ideas. Hardware Hackers are the kind of people who strap ordinary cameras to weather balloons to photograph space, give them things like the Arduino and they make machines which blow bubbles when they see their own names on twitter. Or they make pairs of lamps for lovers separated by distance - connected lamps, so if you switch one of them off, the other goes off too - a little reminder of what your love in another timezone is up to. These are the same curious, hybrid, inventive sort of people who built the web and pioneered social media. They're turning from mucking about with the web to mucking about with the real world because there seems to be a whole new set of interesting things to invent, unoccupied, uncolonised space. I always think the big difference between the Makers and the corporate Internet Of Things lot is that the IoT people are trying to make the world more efficient and controlled and the Makers are trying to make it more personal and magic. They're imagining objects that come to life like they do in Harry Potter. My own experience of all this was sparked by a project called Homesense started by my friend, the designer, Alexandra Deshamps Sonsino. They wanted to know what gadgets families might build for themselves, if got the chance, so they gave a little bunch of us a kit full of useful electronic things and an Arduino, and equipped us with a tame programmer to help with writing the code. We live in London and there are four of the London bike hire scheme stations around our flat. I never know which one to walk towards in the morning, so as soon I leave the flat I'm poking around in my phone using one of the apps to tell me where the bikes are. So, using the Homesense stuff, we built a little map that sits by our front door and does the job instead. It's an ordinary paper map with some LEDs poked through, so if there are more than five bikes at a station it lights up. It's dead simple, it's not life-changing, but it makes things slightly nicer and it's something that's only possible with this kind of technology. It would make no economic sense for anyone to manufacture anything like this en masse, it only works if you live in our flat. And it was relatively easy to do. This makes me feel like we're on the edge of something interesting; something Andy Huntington has called 'the GeoCities of Things' - the moment when it's as easy to make personal technology objects as it was to make a GeoCities page. 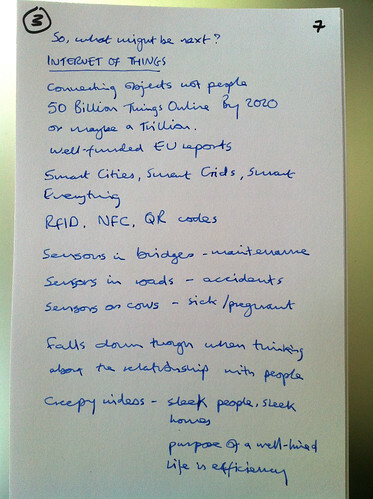 So I wonder whether the 'Internet With Things' is a more useful term than the 'Internet Of Things'. As Matt Jones has said "The network is as important to think about as the things" and the network has people in it. We're in there with the things. And people are looking for more than just sleek efficiency, they're after something else, something unexpected. That's why, personally, I'm way more excited about what the Makers are doing than the big industry initiatives. The exciting, radical, life-affirming stuff is going to bubble up from the enthusiasts and tinkerers and the people who build tools for them. Especially when those tools include things like cheap 3D printing and personal robotics. And people are going to start making their own things and connecting them up to the internet. And those things will be dismissed as pointless and silly and a waste of time and pundits will wonder 'why would anyone want to do that?' just as they did with Twitter and Facebook and GeoCities. It's not just about the thing. It's about the relationships and satisfactions connected to the thing and to the making of the thing. That's what we need to remember. The Internet Of Things will be useful and interesting, the Internet With Things will be a flourishing of ideas and magic at least as exciting and creative as we've seen with the Internet Of Screens. Blogging was liberating for me and lots of people, social media does the same thing. When we get tools as good as that to help us make our own objects things are going to get fascinating. And that's almost it. If you want to know more there are two essential books to get you going: Shaping Things by Bruce Sterling and Smart Things by Mike Kuniavsky. They really know they're talking about. And get yourself an Arduino, look up what to do with it, start making things. And, finally, I said at the beginning how important blogging has been to me. How much it connected me to a new network of friends who've helped me think about all this stuff. So I want to thank them. All the people I've mentioned in this talk, the good people of Scrutton Street and especially Matt and Alex. Huge thanks and Happy Making.